Borage (Borago officinalis), also known as a starflower, is an annual herb. It is native to the Mediterranean region and has naturalised in many other locales. It grows satisfactorily in gardens in the UK climate, remaining in the garden from year to year by self-seeding. The leaves are edible and have a cucumber-like flavour. The plant is grown in kitchen-gardens for that purpose in some parts of Europe. The plant is also commercially cultivated for borage seed oil extracted from its seeds. 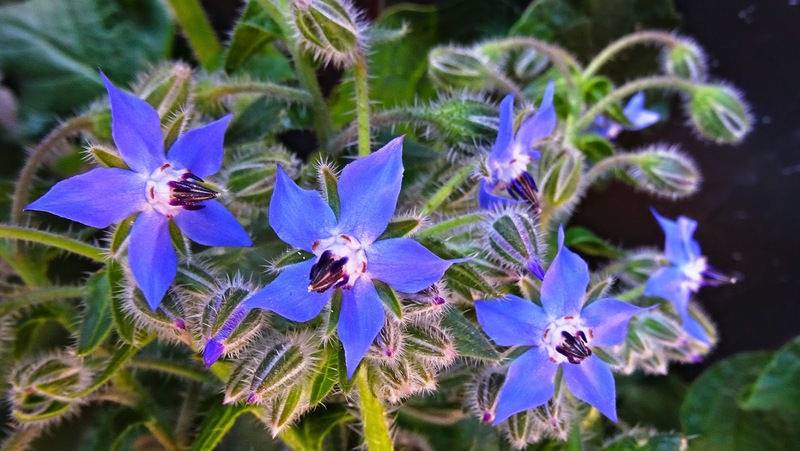 Borage is used in companion planting. It is said to protect or nurse legumes, spinach, brassicas, and even strawberries. It is also said to be a good companion plant to tomatoes because it confuses the search image of the mother moths of tomato hornworms or manduca looking for a place to lay their eggs. Traditionally Borago officinalis is used in various disorders, such as gastrointestinal (colic, cramps, diarrhoea), airways (asthma, bronchitis), cardiovascular, (cardiotonic, antihypertensive and blood purifier), urinary (diuretic and kidney/bladder disorders). In Iran people make a tea for relieve colds, flu, bronchitis, rheumatoid arthritis, and kidney inflammation. It is said to be warm in nature and alleviates symptoms that are caused by using food that is cold in nature such as cucumber and fish. People with heart problems can benefit using the borage tea, since it promotes reaching more oxygen to the heart, that’s why one should use this herb in moderate amounts. Osteospermum is a genus of flowering plants belonging to the Calenduleae, one of the smaller tribes of the sunflower/daisy family Asteraceae. The common name is African daisy or Cape daisy. Osteospermum used to belong to the genus Dimorphotheca, but only the annual species remain in that genus now; the perennials have been placed in the genus Osteospermum. 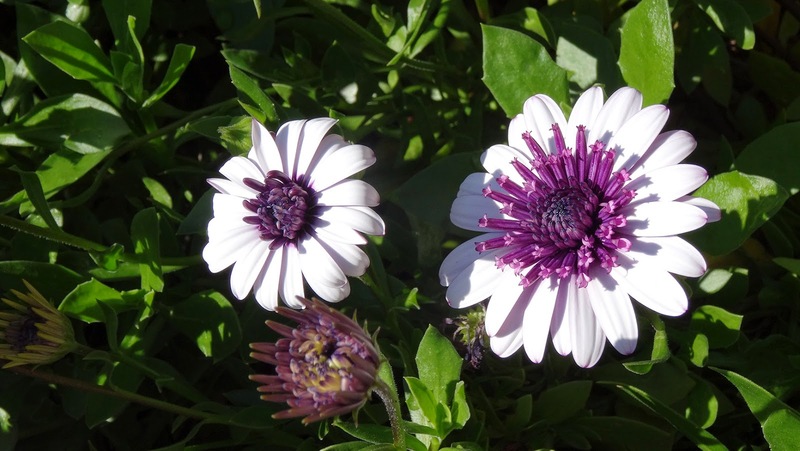 Osteospermum is also closely related to the small genus Chrysanthemoides, and the resemblance is seen in species such as C. incana and C. monilifera. Osteospermum ‘Flowerpower Double’ are quite unusual and are currently gracing our garden. There is a wide variety of colours making for a very pretty display. 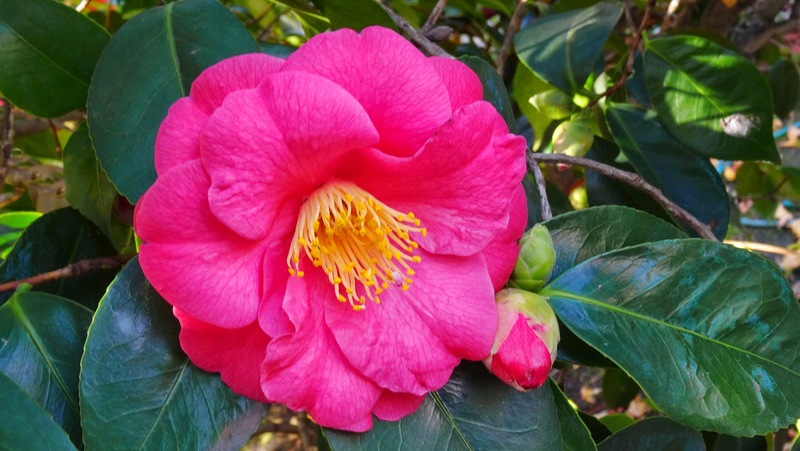 The flower below is a Camellia japonica 'Covina' variety. This is a sun tolerant camellia with an upright, spreading habit. Its medium semi-double blooms are reddish pink and appear in the winter to spring season. Chrysanthemums have been traditionally associated with Mother's Day in Australia. 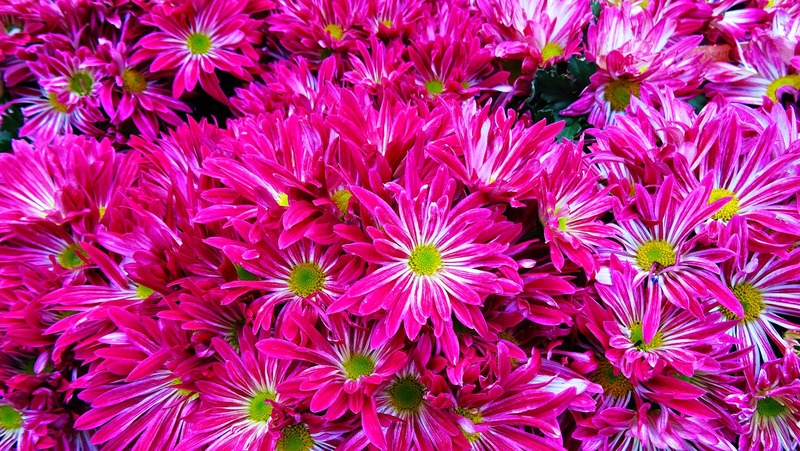 Nowadays, other flowers have challenged the Chrysanthemum as the most popular flower for Mother's Day. 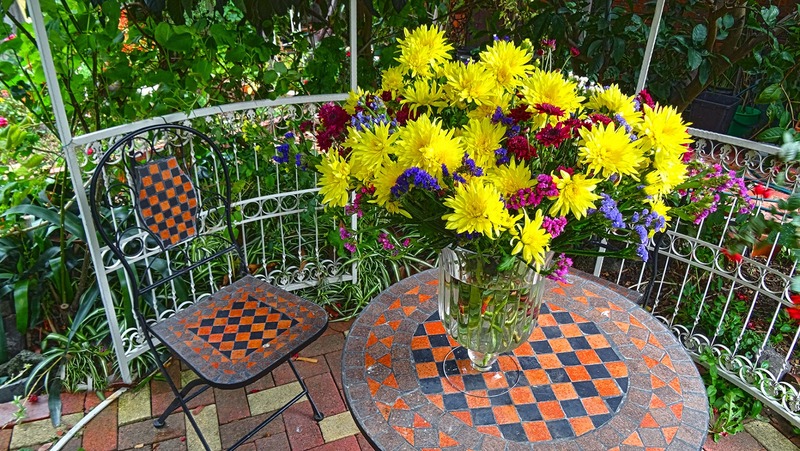 Nevertheless, as Mother's Day in the Southern Hemisphere is an Autumn anniversary, the Chrysanthemum is in its glory. Numerous Chrysanthemum hybrids are now available in single, double, pom-pom, daisy, starburst forms and an amazing range of colours. Potted blooms are a perfect way of presenting a wonderful flower that will last a long time, to that very special and much adored person in ourlives. Here in the Southern Hemisphere, May is the last month of our Autumn and the time when chrysanthemums are at their best. Our May Day bouquets therefore look like this, with lots of chryssies, statice and daisies. Wishing you all a very Happy May Day!